This extra tough pipe consists of four interlocked layers, each is .018" thick. 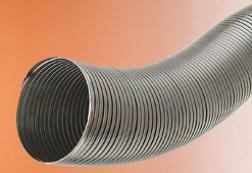 This design gives the pipe maximum strength and flexibility (26" and 32" bending radisu for 6" and 8" diameters). HomeSaver offers the best warranty for woodburning and wood pellet applications in the industry. This outstanding lifetime warranty covers not just workmanship and materials, but damage from chimney fires, as well as other possible misues. Use the 304-alloy for wood burning applications. It has a lifetime warranty for woodburning and is available in 3" - 12" diameters. Use the 316-alloy for Oil, Coal, and non-condensing gas. has a lifetime warranty for woodburning and is available in 5" - 8" diameters. All RoundFlex diameters of 3" - 12" are UL Listed for wood, coal, oil, and non-condensing gas when installed according to the manufacturer's instructions. In 304-alloy RoundFlex we stock 3" - 10" in 25' coils. 5" - 12" diameters are also stocked in 5' lengths. In 316-alloy we stock 5" - 8" diameters in 5' lengths and 25' coils. Special order lengths are available - they are shipped the next business day from HomeSaver's manufacturing plant in Cleveland, Ohio.